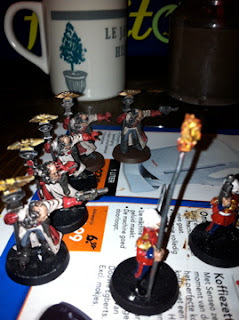 This week I have a game of 40k planned against orks. 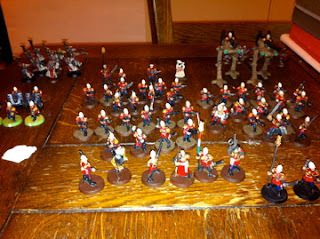 Because I haven't got the new chaos codex yet, I decided to bring out my Imperial Guard foot army.Since I intended to finish this army this year as well it seemed like a good time to try and at least finish some more models for the match. Since it's only 1500 points, I can't use many extra units. I always use three platoons of three squads, costing me about 1000 points. 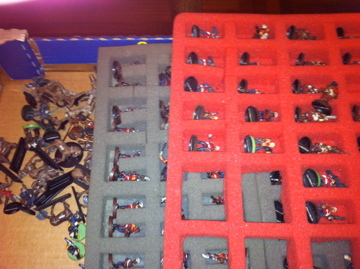 Next in are my rough riders and ratling snipers. 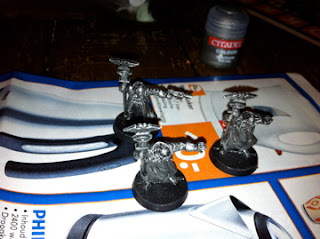 My psyker battle squad has been three guys short for the past few years. Last year (Sinterklaas) I got the last three as a gift, but never got around to paint them. Hopefully I can post a few pics of the battle and the army in full after the game friday. Below a small preview of the first platoon of the 4th Hollan ' Emperor's Own' Line Infantry Regiment, 3rd company ' The Ostriches'.